I manage Raid 1 with LSI Controller ( SAS9211-8i ). Recently one of the Hard drives failed, I replaced him and booted the machine, Entered the LSI utility, and I noticed it's 'Rebuilding' and syncing the raid. But, after about 30% of syncing, I received 'Failed' status over the 'Rebuilding' on the new hard drive. I also tried to replace the new hard drive with a different new one, Same error. I have no clue why is it Failing all the time. and because the raid 1 is in status 'Degraded', My OS booting as 'read-only' mode and won't function properly. Thanks a lot for the helpers! Your replace,ent drive is 2TB while the current functional drive is 160GB. Raid usually requires enterprise class drives. Your prinary is also a desktop drive. 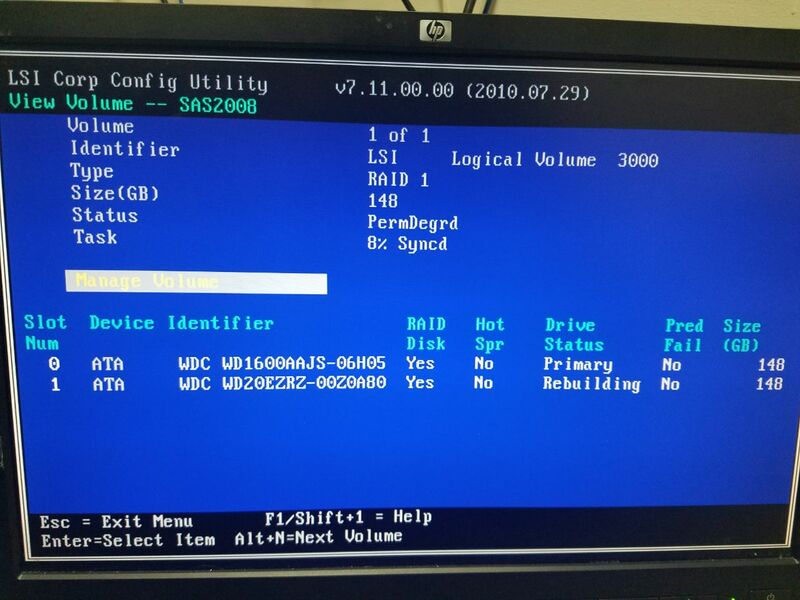 Look at the raid controller log, if the write is not responded to within an acceptable time, the raid determines that the drive is possibly faulty terminating the operation and possibly kicking the disk out as failed. It isn't the green disk. It isn't enterprise vs consumer class. It isn't 160GB mirroring with a 2TB (lowest common denominator wins). The problem is that the 2TB is an AF drive, 4KB sector size. The other disk is 512b sector size. You can NOT mirror those two drives. Get a drive with NATIVE 512byte sectoring and you'll be fine. P.S. reason it didn't blow up from the beginning is that the controller firmware is ancient. It doesn't even know what a 4K sectored drive is. If it was running current firmware it would have told you that it won't work before it even started a resync. But at this point, do NOT update firmware on controller. Get a compatible disk, resync, then update controller firmware & drivers. NEVER update firmware when you have a degraded system.